We conducted hundreds of tests in 2009 to augment the marketing of research partners in a variety of B2B and B2C industries. When demand is soft, make your value rock solid. Making a sale or generating a lead is a matter of trust. But in 2009, customers were more skeptical than ever. To overcome that anxiety, the clarity of your value proposition is paramount. Experiment #1 illustrated how a Research Partner strengthened its value proposition to gain a 201% increase in leads. When you have few resources, make your page do more. Many marketing budgets have taken a hit in 2009, and marketers are often asked to do more with less. But your website may be the most overlooked member of your marketing team. Experiment #2 showed how a Research Partner garnered higher-quality leads with lower cost per acquisition by signing its web page up for a new responsibility. When customers are overwhelmed, change your focus. What are you focused on? Your product? Or the best way to communicate your product to your customer? It may seem like splitting hairs, but by taking a step back to find a new approach to communicating your value proposition that you may have overlooked, you can realize impressive gains. In Experiment #3, a Research Partner rides the much maligned pop-up to a 63% increase in conversion. When it matters most, measure what matters. It’s easy to be overwhelmed with the array of measurement options offered by web analytics. And while many of these numbers may be good intermediary measurements to guide your testing efforts, you must never lose sight of the big picture. 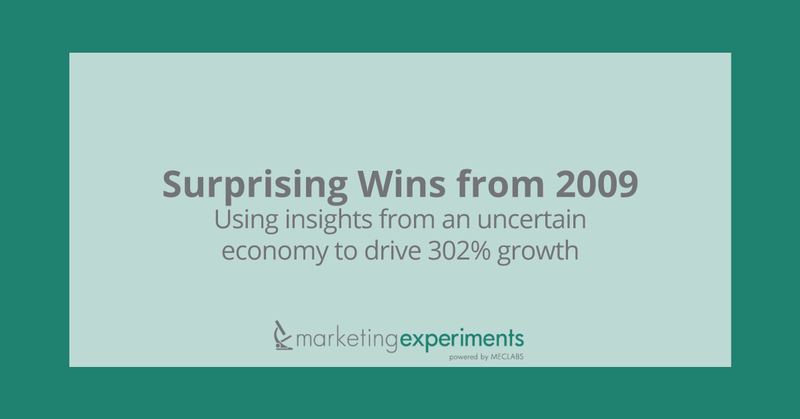 In Experiment #4, a Research Partner generated a 302% projected profit increase. Not clickthroughs or conversion. Profit. And in the end, that’s the whole point. Read the clinic summary (PDF) or view the full presentation video to get ideas that can help guide you to success in 2010. You can also hear answers to audience questions that we did not have time to answer during the web clinic on the MarketingExperiments Blog.